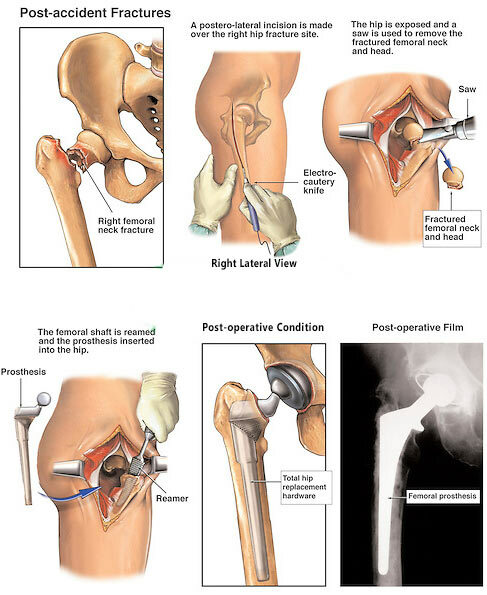 What is Total Hip Replacement/ Total Hip Arthroscopy (THR /THA)? Our hip joint has two parts – a ball (part of thigh bone-femur) and a cup ( part of the hip bone). When the ball moves inside the cup, there is movement in the hip joint. THR is a surgical procedure when part of the femoral head (ball) and damaged part of the cup is removed and replaced by artificial one. We perform THR through the posterolateral approach, and most of the time we perform it by a minimally invasive surgery (MIS total hip replacement). Rheumatoid arthritis or other inflammatory arthritis. Osteonecrosis where blood supply of the femoral head is disrupted. In these conditions when pain is unbearable, and it affects day to day activities, or it disturbs sleep. Total hip replacement is also done in fracture neck femur. Depending upon the fixation method it is of two types. Cemented THR- here the cup and the femoral stem is fixed with bone cement. Uncemented THR- Here there is direct bone growth in the prosthesis. Once it has been decided that surgery is the only solution preparation for total knee replacement will start and on first-day patient need to spend a long time with the team of doctors, physiotherapist, dietitian. We take a time to know details of your medical history. A thorough examination of knee joint along with spine, hip and other joints are done. Details of Skin, Dental and urinary system condition is very important and require prior treatment may be necessary. Through the Blood test, cardiopulmonary testing, urine analysis is done. You may have to discontinue or alter some of your home medications if needed. Quit smoking at least two weeks before surgery. Admit patient one day before surgery. Anaesthetist, Surgeon, Physiotherapist, Dietitian will visit you. You can discuss the type of anaesthesia with the Anaesthetist. Generally, surgery is done by spinal anaesthesia that is by a small injection at your back, and the lower part of the body is paralysed for 3-4 hours. An operative area will be washed and draped with the antibiotic solution at the night before surgery. Next day it takes 1.5 hours to complete the operation, and you will be moved to bed. After 1-2 hours liquid such as soup, tea is allowed and 4-5 hours normal diet will be started. Pain is controlled by injections. A patient can seat on the bed on next day. Physiotherapist starts some bedside exercises. On 2nd day patient is allowed to stand with support and walk with walker or crutches. Injectables are stopped and depending on medical condition patient is discharged on 3rd or 4th day. In the case of bilateral hip involvement 2nd hip surgery can be done 3-5 days after the first surgery or at different admission later. An attendant is a must for the initial few weeks who can help the patient for taking meals or getting dressed. A physiotherapist will visit once a day for few weeks and help you with some strengthening and mobility exercises. He will help to walk with walker or crutches. Exercises must be repeated 4-6 times daily by the patient himself. Training for climbing stairs can be started at 2-3 weeks depending upon the progress. While going up, patient should use the non-operated limb first and for coming down operated limb should come first. Gradually as strength is gained patient can take the regular pattern. Once the patient gets his balance right, he or she can start walking without any support. This depends on the patient’s age and overall fitness. The most patient can start normal activities independently even if in a limited fashion by 4-6 weeks. Keep pillow in between two knees. Do not bend forward or squat or sit cross-legged. Keep dressing dry for two weeks till stitches are removed. Always sit on a high chair or high commode. After a successful knee replacement, there will be significant relief in pain and increase in movement of the hip joint. A patient can perform all routine activities and can participate in sports like golf, swimming, riding a bike. However, high impact activities like running are not allowed.We perform minimally invasive surgery (MIS total hip replacement ) through the posterolateral approach. This technique results in the much smaller incision, less traumatic and unlike other approaches it does not damage abductor muscles, and that ensures less pain and morbidity and early recovery to normal life. Blood clots, infection, dislocations are some of the complications. Although the incidence of those complications in any good hand is negligible. Total cost of Total Hip Replacement in Kolkata depends on the type of implant that will be essential for the patient and also the type of setup. In general, total cost of cemented THR starts from Rs 60,000 and for uncemented THR is about Rs 90,000.